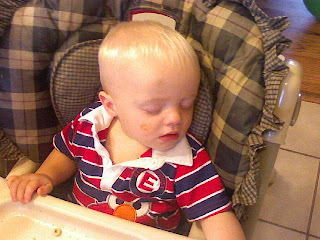 Blair Family Blog: Porter fell asleep in his high chair. Porter fell asleep in his high chair. This has never happened. Kind of nice. How funny- he must have been exhausted. Carson did that every once in awhile, but Hannah never has. Such a classic picture!